QUALITY CRAFTSMANSHIP IS THE STANDARD AT AKAR LOGISTICS. We, at AKAR LOGISTICS believe that you expect & deserve a well-built high quality home at an AFFORDABLE price. From the computer- generated floor plans and home designs, to the solid construction and beautiful, professionally designed interiors. 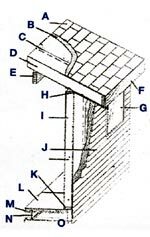 A. Bituminous Fiberglass shingles or metal shingles. C. Sandwich Panel with OSB top Board. G. Per- cut for windows and doors. H. Top Steel plate structure. L. 3/4" Plywood subfloor nailed. N. Steel Joists, W on-center. AKAR mobile space unit is becoming one of the most innovative diversified and quality minded manufacturer within the industry. Experienced in many products such as : Contractors field offices. Temporary mobile. Modular office building. Motel room Modules, bath and shower rooms. Guard shacks. In - plant offices and Housing, permanent classrooms, Training mobile, Multi - story Modules, Storage units. Display units, emergency offices and much, much more. 1. Frame: AKAR boxmobile utilizes a heavy guage self supporting. Steel frame with container corners. They are stackable and inter connectable. 2. Floor: Metallic structure entirely welded and painted covered standard with 18mm. OSB wooden boards in dry areas and 18mm. marine plywood in wet areas, witt rolled PVC. covering. - 50mm polyurethane sandwich panels with galvanizec bottom side and different options for the top side (wooder board, cement chip board, ceramic tiles). - Galvanized bottom side with 50mm, fiberglass insulation, 18mm, wooden board and rolled PVC. covering. - It could be supplied with skids. 5. Windows: Aluminum of sliding or hinged type glazed and incorporated flyscreen. Interior curtain as option. - built in window. - Aluminum door. 7. Electrical installation: It is carried out on inspection race ways with PVC tubing. Layout & requirements are according to customer's wishes. Akar produces different types of mobiles. Is a versatile, multi-purpose mobile modular space system, utilizing the time tested and proven building block concept. The self-supporting steel framed units can be stacked & inter- connected to provide an economical system solution for mobile space & temporary space needs. The boxmobile are designed to eliminate most transport problems. When demountable, the unit is 60cm, high, so that four units take up the same room as a container. The boxmobile can be supplied in standard sizes that can be easily adaptable one to another to obtain units of various forms and dimensions, all of them characterized by ease of transport. AKAR haunched mobiles are factory assembled having their roof haunched for homey look appearance. Outside walls can be given a colorful sandstone effect finish. It is similar to boxmobiles but having towing system complete with wheels, hooks and retractable stairs.